OCAU (http://www.overclockers.com.au) is a fantastic Australian based online forum. Originally created for the hobby of overclocking computers, this vibrant forum has expanded into many different hobbies and activities; one of these being Photography. In fact the forum is responsible for a lot of inspiration and also where I purchased my first DSLR. So each month they have a themed competition in the Photography section. This is called the ‘Iron Photographer’ with the winner receiving a prize. Now i like to try and get creative with these themes, and I find it a good way to gain inspire and try something outside of the box. 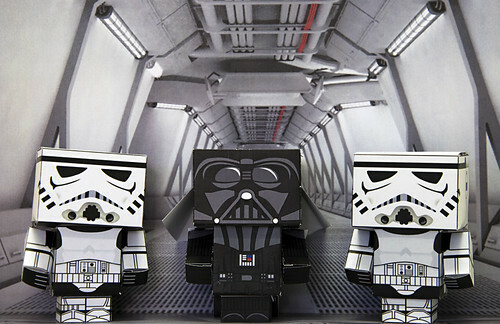 So this month the theme was ‘paper’ and after having a look around, I found some paper stormtrooper models. Going with the whole star wars theme and my current project 52 with Stormy Stormtrooper; I decided it was a great opportunity to try something new. Infact.. I think it has worked marvellously and the entire thing was done with paper and a printer (plus many hours of my hard labour, some paper cuts and lots of swearing). Never the less.. I am very happy with the result and I hope I have earnt your vote this month! Some more Stormy Stormtrooper coming this weekend Here is a behind the scenes shot, of how I set the photo up.